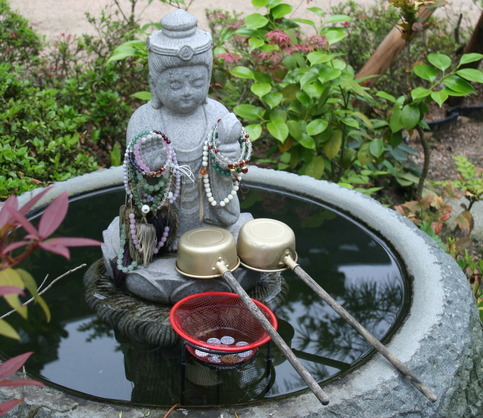 My first exposure to “intuitive flow” yoga was at the White Lotus Foundation in Santa Barbara. Earlier this week I revisited this kind of a practice just to see what would come of it. The experience I had was revelatory and I truly felt my body was a vessel and I was pouring into it my desire to feel and be led by it. It was poignant because I had just revisited the concept of dhyana and dharana from a tantric perspective in a workshop series I taught recently at yogaview. Dharana and dhyana are classically considered 2 separate rungs on the ladder towards samadhi. If we flip that inside out, as tantra does in its efforts to loom existence, then dharana and dhyana can be seen as a process and in relationship which creates samadhi, which in this case, is the experience you ARE having rather than an experience that you are SUPPOSED to have. In tantra samadhi is not singular, but rather the experience you have that further weaves you back into living your life. Bhavana literally means “becoming” and can be understood as our “attitude”. This passage from The Yoga of Discipline reminded me of the saying, “consciousness flows where energy goes”. What do you desire to be, or make, or do? Focus your energy there and pour your awareness into that. The outcome is what it is…that’s samadhi. Your dhyana flows into your dharana and what transpires is alchemical. Likewise, your practice can stem from an organic flow of consciousness itself. Your physical practice can be a means of becoming something other- what you choose to pour into the vessel. The aim then is to make the same connection when you aren’t “doing yoga”. How often do we even consider that we are weaving our own experience and perhaps have some control in the matter? What we choose to become (our attitude) or what our bhav is will give life to what we are concentrating our efforts on as much as the circumstances will have an effect on us. There is a relationship between what we focus on and what the outcome is. The intuitive flow I practiced on Monday felt wonderful and it gave me some ideas on what would be nice to teach this week. It was great to have no boundaries and see what came and from there I was given direction. It seemed obvious afterwards that this is what my process was going to be like this week after spending hours compiling the lecture portions of my workshop series. My energy had already been focused there and I was ready to receive what came from that.